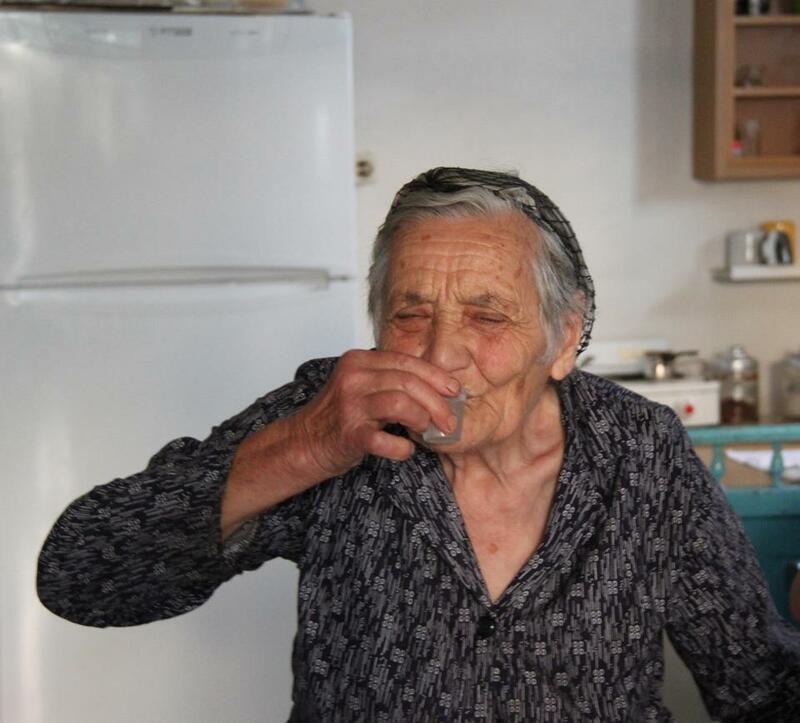 In this picture, Marika from Skoteino Crete toasts our group and downs a glass of her homemade raki. Marika, who is best friends with Christina who makes lunch for us, has just returned from her home next door with her gift of a glass of raki for each of us. Marika, who has little, is eager to give to us. Hers is but one of many gifts from the heart we receive on the Goddess Pilgrimage to Crete. Why is it that we who have so much do not give as spontaneously? One answer is that capitalist individualism has taught us to count our worth by how much we have and to fear for the day when we will have nothing. These words may be a cliché, but they hold a profound truth nonetheless. Heide Goettner-Abendroth tells us that in matriarchal societies with small-scale sustainable agricultural economies, people did not hoard or save for a rainy day. With the labors of their bodies and minds, they took only what they needed from the land. When there was a surplus, they gave parties, sharing what they had with others. Even with the coming of patriarchy, ancient matriarchal customs of generosity survived among rural farmers. According to Shiva western development programs in India (and around the world) are based in the spirit of capitalism which counts the value of work according to the criterion of profit. By capitalist standards, rural sustainable agriculture economies are considered “unproductive” because they produce for local consumption but not profit. But these economies are not valueless. When not threatened by war, racism, or excessive taxation by overlords, small scale agricultural economies have fed and clothed people and provided them with all they needed to live for millennia. Traditional rural economies were not capitalist. They did not use money as a form of exchange. They did not have banks. They did not encourage saving as there was no money to save. When times were hard, people pulled together and helped each other. Trade has always been a part of rural economies. But traditional economies were not based on the idea of producing excess products, to be sold to others at a profit. No one got rich on the backs of others. While the capitalist mindset defines traditional rural economies as unproductive, Shiva and other environmentalists view them as living examples of the productive, sustainable, and bioregional relationship to the land that visionary environmentalists struggle to imagine. To see value in traditional rural economies requires a transformation of capitalist values. It requires us to see the meaning of life in terms other than making enough money to buy more and more things. In the small village of Tylissos in Crete, Maria lives in a small home centered around a courtyard with a kitchen garden to one side. She now has an electric stove and refrigerator; her modern bathroom is next to her bedroom rather than outside; and she can communicate with her children by telephone. But she must still go into the courtyard to get to her kitchen, and in the summer she often cooks over an open fire. Like, Marika, Maria is generous with what little she has, offering tea, coffee, and her own golden raisins to our group. In order to understand why Shiva and Roy are fighting against western development programs in India, we must be able to see value in a way of life not based in saving, hoarding, and trying to get more. Surely rural life is improved with telephones, electricity, and flush toilets. But that may be all the development that is needed. The maldevelopment programs Shiva and Roy are fighting displace people from their villages, creating urban poverty and destroying sustainable relationships with the environment passed down over the centuries. So much is being lost. So much is already lost. Hi Irene, good luck with your book. I certainly am not a Marxist, crude or otherwise. However I do find capitalism deeply flawed. I love this post, Carol, because you state the case for valuing the old women of Crete (and elsewhere in the world) who still live by sustainable values. These old women are so often the ones least valued in society, and yet in places like the Greek villages you & I are lucky to live in and visit, we see how they keep alive a precious and ancient worldview which might just yet have the power to save us all. Meeting Maria & Marika in Skoteino, and receiving their saved hospitality, was one of the highlights of your Goddess Pilgrimage to Crete. You describe so beautifully just why meeting them and glimpsing their way of life is so important. I am so grateful that my research into traditional women’s dances allows me to spend time with wise women like them in many places in Greece, the Balkans and Asia Minor. In my view, they, and the songs, dances, rituals and customs they still preserve, embody the ethic of community, sustainability, generosity, mutual support and connection to the earth which is our living legacy from matriarchal times. Bless Marika’s beautiful heart! And thank you for her beautiful photograph, Carol. Thanks for your many-faceted compassion at FAR, Carol! Just a comment on the value of existence, where you say: “It requires us to see the meaning of life in terms other than making enough money to buy more and more things.” I absolutely agree, but there’s another side to it. Because the cost of living keeps rising, for the elderly who are poor and living on fixed incomes, the older they get, the tougher it is to make ends meet. The worry, just in terms of financial survival, or whether they will even have enough for their basic needs, becomes then the meaning of life itself. Yes of course you are right Sarah, but the people you are talking about are living within the capitalist system, not in the traditional economy. We who live in the capitalist system in countries that do not provide for social welfare, do have to worry. But development programs do not have to destroy what is left of traditional economies and we could learn from them about how to restructure advanced capitalist economies if we had the will as a people or a country to do so. Thank you for this, Carol. I’m currently reading Heide Goettner-Abendroth’s book, “Matriarchal Societies,” which was translated into English last year. She has researched societies with matriarchal patterns that are socially egalitarian, economically balanced, and politically based on consensus decisions. I think that these models are the only hope for humanity. Another book worth reading is Jerry Mander’s “In the Absence of the Sacred: The Failure of Technology and the Survival of the Indian Nations.” He explained (back in 1992!) that “models for restoring our relationship with the Earth exist in the cultures of native peoples, whose values and skills have enabled them to survive centuries of invasion and exploitation.” But, how do we begin to make the necessary changes? How do we inspire people to change? After seeing the musical Ragtime recently, I read Vivian Gornick’s biography of Emma Goldman (who is a character in the musical and in Doctorow’s book). Emma (1869-1940) preached against capitalism in the first half of the 20th century, and when she refused to stop speaking, she was deported. That didn’t shut her up, either. Gornick calls her a “born refusenik.” What if we all turned into Emmas? Or maybe she was too loud, too impolite. We’ve all seen the cartoons of the early 20th century capitalists–huge, huge, huge, greedy men. Today they look more like us. Yes growth is unsustainable. It means exploiting new markets and exploiting the environment. When you think how easily a few billionaires have convinced our society that they”NEED” smart phones, ipad, pods, etc. it doesn’t seem possible to me that our society will ever see any value in the type of environments and people you describe. 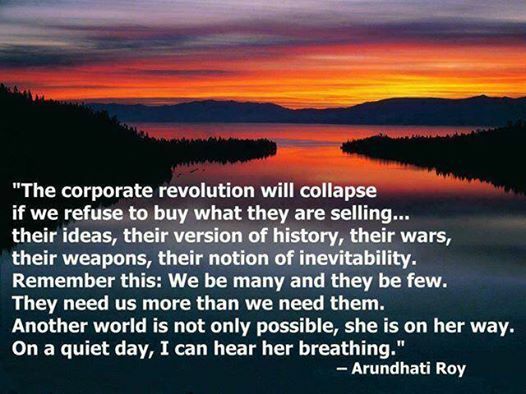 Even our religions have bought into “bigger is better” and the more we can get the better off all will be. I have only hinted at suggestions that we might think about what we are doing but NO-ONe even hears me. True of course but a girl can hope.